There is a story behind this chili. The first time I made chili, it was for a chili cookoff. I’m not a big fan of beans, so I decided to make a chili without beans, and of course, like everything on this site, this is a chili without onions. I decided that what I really needed was to replace the missing ingredients with something fitting that wouldn’t seem like filler. I wanted it to be very meaty, which more than makes up for the lack of beans. I wanted the flavor to be fruity and smoky, like pipe tobacco, but fiery enough to make you think you had just dropped the coals on your tongue. Going to our local Co-op, I found my answers. Dried cherries (nothing added) and Fresh, rather green mangoes. They also had a fresh shipment of beautiful red, fiery Fresno peppers. As I picked one up, I noticed the produce sticker with its SKU#: 666. Chili of the beast was conceived. I picked up quite a few other ingredients while I was out. If you plan to make this, you should read the full process first so you know what you are getting into. Turn on the pan good and hot, and throw some cumin in the pan. Don’t skimp, this will be your primary spice. Keep an eye on it and stir it around until it gets good and hot. It may start to brown slightly. Taste it when you think it may be toasted. It shouldn’t be bitter or you have over done it. Remove it from the pan, toss it in your spice grinder and grind it just enough to crack each seed into a few pieces. Set it aside or in the pot or crock pot you will be cooking the rest of the chili in. I started with a hefty quantity of ground beef. This should account for about 1/3 of your finished volume of food. I’ve also used cubed sirloin or chicken to good effect. Add the ground beef to the pan and chop it up with a spatula until it is in one inch sections. It should be sizzling hot. Add a dash of soy sauce to sear some extra flavor on the outside of the meat. Continue stirring and cooking like this until there is just a bit of pink left on the meat. Remove the liquid out of the pan and pour it into a paper cup and put the cup in the refrigerator. Add a small amount of spices to help give the meat a bit of a different flavor than the rest of the chili. I used some Five Pillars and some turmeric and coriander. If you have done this before, get the previous cup of skimmed broth from your freezer and add it to the meat, putting it on a low heat until the liquid has condensed into the meat, otherwise call it done. I do recommend cooking the meat well in a broth. I’ve found that the flavor of the chili doesn’t do well with added salt and meat flavor directly blended in, but is really good when the meat carries these flavors. Start with a good quantity of fresh Pasilla and Ancho peppers. They should make up about a third of your total volume. Find a source of clean fire. A gas range will do, but I used some burning applewood. A barbecue works well, or if you use your fireplace, make sure you haven’t been burning anything nasty in it. One by one, put each pepper whole on the end of a kabob and hold it directly in the fire, turning to blacken all sides thoroughly. When it starts to slide off the kebab, it is done. For a more smoky flavor, cut the top and bottom off of the peppers and stand them up in a metal steamer over fire or hot coals, but be careful with this, as it is a LOT more smoky. Cut off the tops and remove the seeds. Slice them up and run them through the Magic Bullet or blender. Add the result to the crock pot. Let it cook for a little while to settle out some of the raw greenness of the peppers. Skin and slice up some green mangoes (about half as much by volume as the peppers). I’ve found they are best when they are showing the first signs of ripening, not crunchy or green as an apple. Put them through the Magic Bullet food processor, and add to the crock. If the pepper or mango flavor is too potent, add tomatoes until it tones down to where you like it. If there is too much liquid, slowly stir in corn flour or fine corn meal. I find it dulls the flavor, but it doesn’t clash. Remove the tops and seeds from some fiery peppers (I use Fresnos or Habaneros). Dice them and add them to the mix. Let it cook for a while and taste. Repeat until it is a little too hot to eat. Let it sit just below simmering for a bit longer for everything to settle. I never quite know what to do with chili once I’ve made it. It is tasty in so many ways. 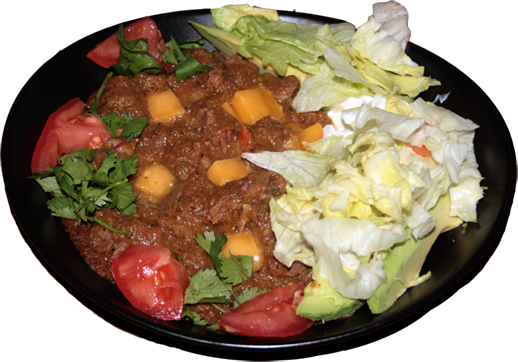 I often just serve it in a bowl with sliced avocado, lettuce, tomato, grated cheese, and sour cream. Garnish with cilantro and black olives. Remember, we made it too hot to eat. This makes it just right when served with accessories. And it was every bit as delicious as it looks in the picture!